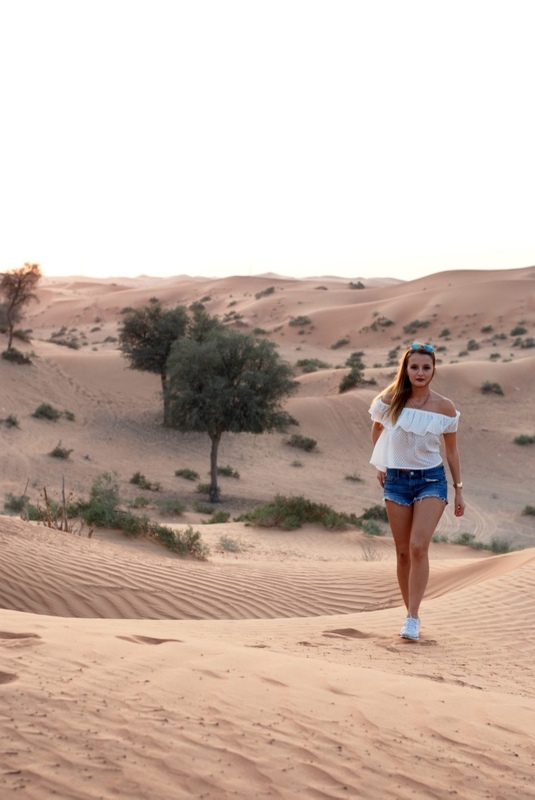 DUBAI DIARY | Sunset Desert Safari – Fashion to go, please! That pretty much sums up how intense this week was so far. On our second day here, following a friend’s recommendation, we booked the Desert Safari Experience without properly having an idea about what was going to expect us. Well, we knew that we were gonna be picked up in a Jeep and that afterwards we would drive through the desert to a bedouin camp and get dinner and various touristy experiences there but I guess we weren’t exactly aware of just how we would be driving through the desert. Let me clarify this for you… As soon as we left the roads, the drivers would let air out of the car tires so they would have more grip on the sand. But instead of calmly driving through the sand the drivers would take us over sand dunes, almost flipping the car over as they speeded over the edge. More than once a group got stuck with their car (there were about 10 vehicles altogether) and we had to pull them out. It was an overly exciting and thrilling experience, much more so than a rollercoaster – which in fact caused us to stop twice because a girl in our car would continue to get sick from this bumpy and shaky car ride. We would have made photo stops anyway, so it didn’t bother anyone too much. But still: she was a poor thing! You know I’m just kidding. It was fun! 🙂 And besides enjoying the show the guests had the possibility to ride camels or quods, smoke water pipe, take photos in traditional clothing and get henna tattoos. Overall: a very well organized and super fun trip! My shoulders still hurt from holding on to everything I possibly could and as hard as i possibly could in the car! haha! Some of you might recognize this Outfit because actually it’s been one of my summer favorites this year. I chose it over everything else for this trip because it is very practical – with the jeans shorts, sports shoes and the light fabric of the top which makes it easier to tolerate the hot temperatures – but still looks preppy in some way. I didn’t want to wear anything too tight as it would stick to my body in the heat and would start making me feel uncomfortable as it would also make me sweat. Since I’m always being honest with you guys I also admit: the red lipstick wasn’t really necessary. But it happened to have become my favorite colour to wear on my lips. So lately I really wear it most of the time when I’m out. It really was love on first sight and I’m sure you can relate to this in some way or another, don’t you? I’m just sort of waiting for the day to come when I will get tired of it – eventhough I’m hoping that moment will never come! Tomorrow will be our first day sightseeing in Dubai’s inner city and I’m so excited about it – so there’s nothing other left for me to say than: STAY TUNED! These pictures are really good and your excursion sounds like it would be a ton of fun! hi, thank you very much! 🙂 It truly was a once in a lifetime experience and I strongly recommend it to everyone who travels the area! 🙂 BR!